This first winter bird has been present on the path leading down to Housel Bay on the Lizard in Cornwall for the last couple of weeks. 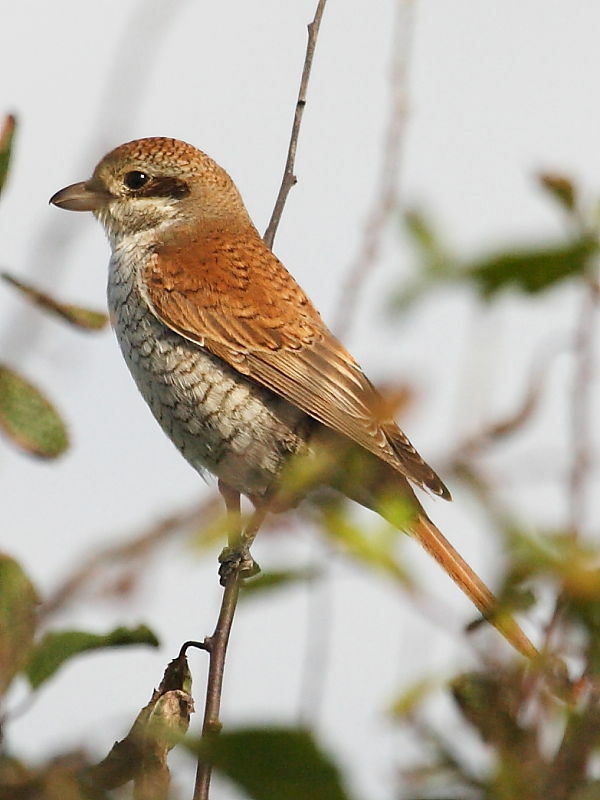 In typical Red-backed Shrike behaviour it has been perching on the top of hedges bordering the fields and making frequent dives onto the surrounding ground and low vegetation to pick up insects. It doesn’t appear to be having any problem finding enough insects and so hopefully it is building up sufficient fat reserves to enable it to continue its journey south to its wintering quarters in tropical Africa. Having become extinct in the British Isles in the 1990s it would be great to see the Red-backed Shrike breeding once more in the south of England. Suitable heathland and open habitat is certainly available and the successful breeding of a pair of Red-backed Shrike on Dartmoor in 2010 and two pairs in 2011 gives real hope that they may return. Time will tell and the presence of any breeding birds in 2012 is unlikely to be made immediately public due to the threat of ‘eggers’ who mindlessly gave this species the final push to extinction in the British Isles in the 1990s. Sadly the threat of egg thieves is still very real to our rare birds today despite offenders facing prison sentences. The Red-backed Shrike is often referred to as ‘the butcher bird‘ because of its habit of impaling its prey on barbed wire fences and thorny bushes. It is fairly easily identified as there are few birds in the UK that it can be confused with. 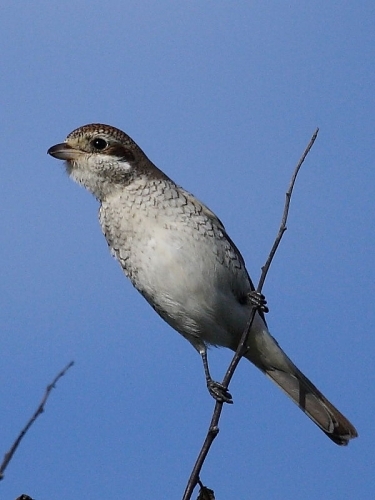 The solid, slightly hooked bill is typical of the shrike family throughout the world. It is one of the smaller species of Shrike, between 16-18cms in length and the only other shrike species of similar size likely to be seen in the UK is the Woodchat Shrike, an annual visitor in very small numbers, and the even scarcer Isabelline Shrike. Despite being a first winter bird this Red-backed Shrike was easily identified from the sometimes confused first winter Isabelline Shrike by the pronounced black highlighted scaling on the chest and side plumage. Best times to see the Red-backed Shrike in the UK are during its migration north during the spring and south in the autumn. At these times small numbers of migrants are reported annually along the coast from the extreme south west of Cornwall, along the south coast and all the way up the east coast as far north as the Orkneys.